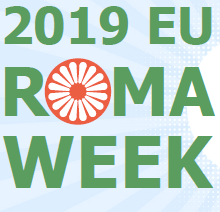 From 18-21 March 2019, the fourth EU Roma Week took place in Brussels, jointly organised by several Members of the European Parliament, the EU Commission, the UN Human Rights Office in Brussels and civil society organisations. The Roma Week offered a framework for a series of events discussing Roma-related policies and giving the spotlight to the fight against antigypsyism. ERGO Network played a leading role in a number of events held during the week. The Roma Week would not make any sense without the active involvement of Roma activists from across Europe. 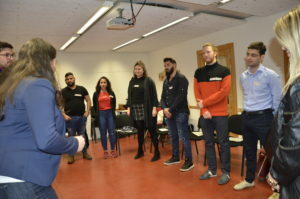 Therefore, together with the Central Council of German Sinti and Roma, the Documentation and Cultural Centre and ternYpe International Roma Youth Network, ERGO Network invited a group of youth activists to prepare for the week in the Roma Youth Advocacy Training. Moreover, ERGO Network coordinated the participation of the most important Roma civil society activists in Europe under the umbrella of the ‘Alliance against Antigypsyism’ together with the Central Council of German Sinti and Roma. Before the start of events in the European Parliament, ERGO members from the project Joint Initiative to Empower Roma Civil Society in the Western Balkans and Turkey attended the conference Roma Inclusion in the Western Balkans: The Forward Look, Policy v Reality, Where the new World Bank report “Breaking the Cycle of Roma Exclusion in the Western Balkans” was launched. The first event in the European Parliament was the crucial Reality Check: Evaluating the EU Framework for National Roma Integration Strategies, where results of the Roma Civil Monitor were discussed. ERGO Network’s advocacy and research coordinator Jelena Jovanovic highlighted good practices and shortcomings of measures combatting antigypsyism, and several civil society representatives gave an overview of their national monitoring reports. On Tuesday evening, two award ceremonies celebrated individuals for their contribution to Roma inclusion: The European Civil Rights Prize for Sinti and Roma was awarded to the Slovak President Andrej Kiska, and 14 inspiring women activists received the EU Award for Roma Integration in the Western Balkans and Turkey under the theme ‘Unknown Heroes’. As a surprise during the Western Balkans award event, Soraya Post MEP received an award too, for her outstanding support to the fight against antigypsyism in the European Parliament. On Wednesday, ERGO Network together with Cornelia Ernst MEP brought the UN’s Sustainable Development Goals as a tool to support the fight against antigypsyism to the agenda. 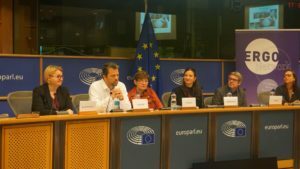 The panel discussion was held together with Global Call to Action against Poverty (GCAP), Sozialfabrik and Soraya Post MEP. The panellists discussed recommendations to civil society on how to use the 2030 Agenda, brought by ERGO Network in the new paper ‘Roma Included’. The flagship event of the week was the conference ‘Creating trust through uncovering and recognising the truth: Advancing recognition and remedy for antigypsyism’, jointly hosted by Soraya Post MEP, the Central Council for German Sinti and Roma, Fundacion Secretariado Gitano (FSG), UN Human Rights Office in Europe, the Open Society European Policy Institute and ERGO Network. The stock-taking conference focussed on discussing the state-of-play and efforts to advance the fight against antigypsyism through truth, recognition, remedy, trust and reconciliation processes. It also gave voice to several survivors of acts of antigypsyism who shared their stories and highlighted the urgency to act against antigypsyism. Members of the European Parliament from different political groups signed a pledge affirming that they will continue to work to achieve non-racist EU elections, an effective Post-2020 EU Roma Framework and a continuation of the fight against antigypsyism in the new legislative period. 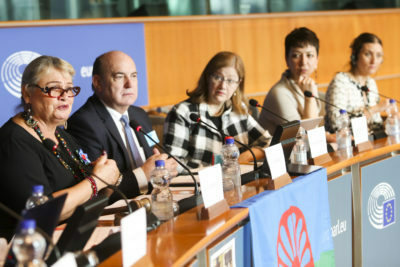 The undersigned MEPs pledged to create a European society in which Roma can access and enjoy their rights set in our Treaties, in which Roma can fulfil their true potential, in which dehumanisation of Roma is stopped, a healthy European society free from racism, such as antigypsyism – a Europe that we can be proud of. Now it is time to let actions follow the words and spirit of cooperation conveyed during the week. We ask all participating institutions to fulfil the promises made during the Roma Week and work together for an effective EU Roma Framework and an increased fight against antigypsyism.